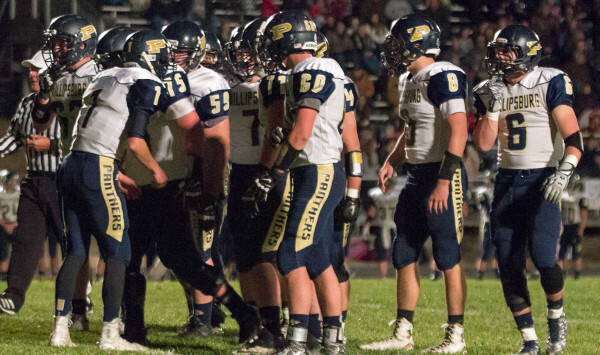 The storylines, offensive balance and personnel are very similar for Troy and Phillipsburg. However, the Panthers hold a significant size advantage. Last year, both squads advanced to the first sub-state championship game in school annals. Troy lost to eventual champion Olpe, while the Phillipsburg fumbled at the goal line in the final seconds of a one-point loss to Ell-Saline. This year, the Trojans (10-1) and Panthers (10-2) qualified to the Class 2-1A state title. Start time is 1 p.m. from Fort Hays State University’s Lewis Field Stadium. Troy won in its rematch versus Olpe in order to advance to Saturday’s game, while Phillipsburg knocked off Mid-Continent League rival and district foe Smith Center on the road for a second time in three weeks. Both schools have fielded talented programs in various sports, but the trophy cases have few state titles. Troy’s only team crowns come on the boys’ side: the 1984 Class 2A basketball tournament and a cross country title two years later. Phillipsburg has been strong in volleyball, football, wrestling and boys’ track, but has just two boys’ crowns in the last 40 years: 3-2-1A wrestling in 1987, and 2014 3A track. Offensively, Phillipsburg had to replace KPreps all-state running back Stuart Lennemann, quarterback Sam Sage and running back Nate Prewitt, who missed the first two months with a knee injury and then moved to tight end/linebacker. Phillipsburg, led by freshman quarterback Trey Sides and a host of new running backs, has kept its usual power-running attack. The Panthers have more than 80 percent of their total yards on the ground. Troy graduated KPreps all-state quarterback Tristan Speer, who had a 36/2 TD/INT ratio. Third-year coach Derek Jasper estimated Troy had a 70/30 pass/rush split in 2014. This season, it’s just over 60 percent rush. “We might have surprised a few people this year after we lost our talented senior class from last year that we were able to get back to that point, and now to make it to the state title game, it’s just a blessing and our kids have worked so hard, and they really deserve this shot,” Jasper said. Phillipsburg, with nine seniors, features senior lineman Kian Stegmaier, a returning KPreps all-state selection at 6-foot, 260 pounds. Senior lineman Donovan Lumpkin is 6-foot, 300 pounds and a returning all-league selection. Senior lineman Connor Boxler stands 6-foot, 235 pounds. Sophomore Dakota Dunning is 6-foot-4, 275 pounds. Even with the backfield has some big athletes, including powerful senior fullback Brock Means (5-11, 210) and sophomore Kirk Coomes (6-1, 210). Ten players are at least 205 pounds. The size has helped the Panthers continually wear opponents down and deliver excellent run defense. Mark Coomes leads the Panthers with 140 carries for 1,184 yards and 11 scores. His brother Kirk has 100 carries for 531 yards and 13 touchdowns. Senior Conner Weinman has collected 114 carries for 826 yards and eight scores. Phillipsburg, a longtime 3A squad, is 20-4 in two years at 2-1A. Troy features seven seniors and 13 juniors, including quarterback Reid Greaser and all-purpose threat Cuttar Huss, the team’s leading rusher (665 yards) and receiver (625 yards). Senior lineman Luke Smith is the team’s biggest player at 6-1, 215 pounds. Jasper, a 1991 Troy graduate and the girls’ basketball coach for the last 19 years, previously coached middle school football. Greaser has run the same offense for five years, including seventh and eighth grade. When Jasper took over, Troy had back-to-back 2-7 seasons and tallied the third-fewest points (91) in 41-team 2-1A in 2012. The Trojans, behind Speer, went 7-4 and 10-2 the last two seasons. They averaged 22.4 points in 2013 and 42 a game last season. The Trojans mainly run spread and I formation and have 43.3 points a game this fall. Greaser has thrown for 1,496 yards and 21 scores. Four backs have more than 400 rushing yards. “Knows (the offense) about like I do, so that’s been definitely a plus,” Jasper said of his signal caller. Jasper said junior right guard/defensive end Wil Smith has “really turned up his game” in the postseason and emerged as a star. Three returning seniors are key: Smith at center, Tucker Morris at right tackle and Ben Wardlow at left guard. Jasper said the Trojans have great chemistry and leadership up front. “Our line is a little bit different this year, a little bigger than we were last year, probably not as quick, and maybe not any better, but they are just very effective all year, and getting on blocks and staying on blocks and maintaining blocks,” Jasper said. Troy opened the year with a 36-18 loss at Washington County and then delivered a wild 37-34 home victory versus Centralia. The Trojans ended a nine-game losing skid to the Panthers. Troy led 30-0 and 30-6 at halftime before Centralia came back and took the lead. The Trojans earned the victory late on a long touchdown pass. Troy has won 10 straight games and became the first 11-man team to clinch a playoff berth. “The way we won that game certainly gave us some confidence that even though we had a big lead and blew it, we were able to win in the end, and that’s something we probably couldn’t have done in years past, so I think that certainly gave us some confidence for the rest of the season,” Jasper said.